Many people have the mistaken belief that Orchids are rare and delicate flowers that can only grow successfully, outdoors in their native habitat, or in commercial greenhouses. While it is true that Orchids cannot be grown anywhere and under any conditions, several Orchid varieties can be raised successfully under conditions no more difficult to maintain than for most common houseplants. Orchids... 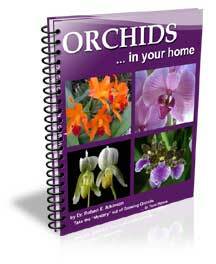 In Your Home is an Report that covers information necessary for anyone beginning with Orchids. Included are Orchid classifications, propagation methods, general culture and care, uses as indoor and outdoor plants, including specific information for home growing some of the more common Orchid varieties. Truly, Orchid growing can be made simple through proper choice of your plants and by following the directions you will find in this report. This eReport is an instant download the moment your credit is approved. It comes to you in PDF format, that can be viewed with free Adobe Acrobat Reader software. You have nothing to lose and everything to gain. If you don't feel the eGuide is worthwhile, just email me and I will issue a credit. So if you're serious about enjoying Orchids in your home, click the "Buy Now" button below. If you need to justify the expense, skip going to McDonald's for dinner once this week and it's paid for.